The DS Series encoder/decoder is ideal for one-way remote control applications. It is used to transfer the status of up to eight buttons or contacts across a wireless link. Addressing is accomplished by the logic state of 10 pins, typically connected to DIP switches. The encoder and decoder are in the same part, selected by the state of one pin. Another pin selects the over-the-air protocol. One protocol is compatible with Holtek® devices, such as the HT640 and HT658. The other protocol is a serial data structure that is much more immune to noise and edge jitter. This protocol offers much more range and reliability than the Holtek® protocol while keeping the simple DIP-switch addressing. The encoders and decoders are configured through a simple hardware interface, so no programming or software is required. When activated, the encoder encodes the current states of its inputs and its address into a packet and outputs a digital data stream. This data can be sent to a decoder by RF modules, infrared link or even a wire. 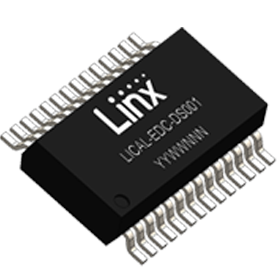 The decoder checks the received packet to make sure there are no errors and that the received address matches the current state of its DIP switches. If everything is good, then the decoder replicates the encoder’s input states on its outputs. These outputs are connected to whatever circuitry is required by the application. Housed in a tiny 28-pin SSOP package, DS Series parts feature low supply voltage and current consumption. The DS Series does not use encryption or rolling code, so it does not protect against intentional security threats. For high security applications, consider the HS Series. Provides a migration path for many customers left unserved when Holtek® exited the DIP switch device market. Opportunity to increase effectiveness in electrically noisy environments or to extend the reliable operating range with the addition of a serial protocol.